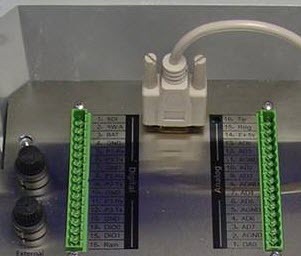 Directly Connecting to a 4100-iSIC Data Logger - NexSens Technology Inc.
A 4100-iSIC is, by default, set up to communicate over spread spectrum radio instead of directly to a PC using its DB9. Select Advanced | iSIC | iSIC from the file menu. This will open the iSIC Setup window. Check the COM Port field. If the RS232 cable connecting the iSIC to the computer is located on a port other than COM1, click on PC COM Port and select the correct COM port. All other configuration settings can remain as 9600 baud N81. Next select Direct connect from the Connection drop-down menu if it is not already selected. Finally the iSIC Address field can be left at the default of “0″. Once the configuration has been set correctly, click on the Connect button. Once iChart has opened the COM port, the Connect button will now say Disconnect. If a message appears saying “failed to open port”, make sure no other programs are using the COM port. Also, if an iChart program is open, it may be interrogating instruments connected to that port. Click on the General tab and iChart will read the iSIC configuration information. After it has done so, make sure the firmware, iSIC time, and main battery voltage fields are present. In the General tab, place a check in the “Change protocol” box. Select Direct from the drop-down menu and then click Apply. Close the iSIC Setup dialog box and cycle power to the iSIC by removing the two fuses. The iSIC is now setup to communicate directly to a PC instead of over spread spectrum radio telemetry. To switch back to communication via spread spectrum telemetry, repeat these steps but select 4100 from the “Change protocol” drop-down menu. 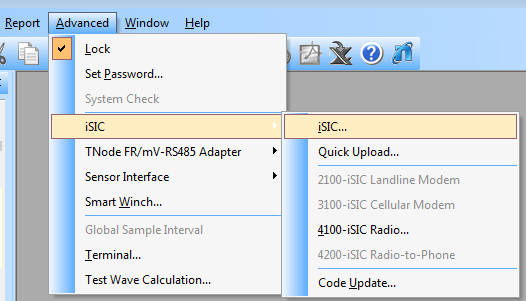 If the 4100-iSIC is already setup in an iChart project file, select it from the Navigation Panel and then right-click and select Property. Change the Connect Through setting to Direct to PC.